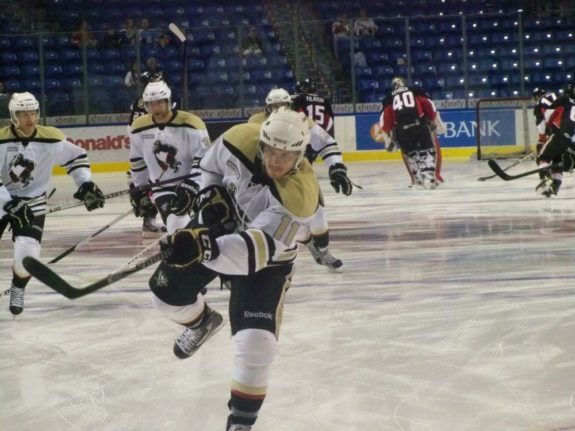 The Wilkes-Barre/Scranton Penguins and the St. John’s IceCaps meet four times per season, with each team traveling to the other for back-to-back games. This weekend, the IceCaps took the trip to Wilkes-Barre and started off the series with a 2-1 victory over the Pens on Friday night. Harry Zolnierczyk scored his eighth goal of the season at 13:23 of the first period with help from Jayson Megna and Chris Conner. But three minutes later, Travis Ehrhardt had his first goal of the season to even things up 1-1 headed to the break. Ehrhardt was a Calder Cup champion with the Grand Rapids Griffins last season. At 7:19 of the second, Adam Payerl and Jordan Hill squared off in the Pens’ attack zone. Hill appeared to have the takedown on Payerl, but the Pens’ second-year tough guy got up and continued to battle, and he wrestled Hill to the ice. Unfortunately, that did little to give the Pens any momentum. Patrice Cormier gave the IceCaps the lead at 15:56. With just under four minutes gone in the third period, WBS captain Tom Kostopolous appeared to have tied things up, but referee Trent Knorr reviewed the shot and waved the goal off, saying the puck never crossed the line. The call drew frustration from Pens fans, some of who had seen what looked like a clear goal on the video board. Cormier sat for tripping with 4:16 remaining in the game, but the Pens were unable to convert on their sixth power play opportunity and force overtime. They couldn’t score on the man advantage at all and are now 21st in the AHL with a 15.5 percent success rate in that category. The IceCaps penalty kill is ranked 20th at 82.6 percent. Jeff Deslauriers took the loss with 14 saves on 16 shots, while Eddie Pasquale helped St. John’s stump the Penguins and stopped 31 shots. The Pens followed up the loss on Friday by bouncing back on Saturday with a 5-2 win. Pasquale again looked to be dominant in the early going, stopping nine shots through two periods, and WBS was even being outshot 10-1 at one point in the first period. Eric O’Dell scored on the power play at 10:08 of the second period. No surprise this one is going down to the wire. That's the kind of weekend its been between to these teams. Then, the Pens exploded with four goals in the third period, with Zach Sill scoring at 16:54 in his first game back after returning from Pittsburgh. He had been re-assigned on Friday, but did not return to play in the first game with the IceCaps. Even enforcer Bobby Farnham got in on the action, as he gave WBS the lead at 5:49. Adam Payerl and Brendan Mikkelson each added two assists, while Jayson Megna had an empty net goal to seal the victory. The @WBSPenguins scored five times in 3rd per. to beat St. John's 5-2 tonight. Pens have outscored opponents 31-10 in the 3rd this season. Eric Hartzell made his AHL debut and made 28 saves on 30 shots. At the end of the game, Kostopoulos retrieved the puck from Sill’s goal so the rookie netminder could have it as a memory of the victory. The Penguins are off until Wednesday when they travel to Glens Falls, New York to face the Adirondack Phantoms. The IceCaps are in the middle of a six-game road swing and get no rest, as they will head up to Connecticut to take on the Bridgeport Sound Tigers on Sunday afternoon.